A tutorial on relational databases and the ST. 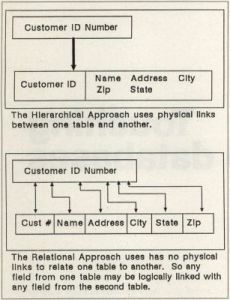 The relational database was created in the early 1970s as an answer to the old hierarchical solution to database design. Since then, the relational model has become the recognized standard database system in the mini- and mainframe computer world. With the power of the Atari ST, the relational database has been brought into the microcomputer industry. This article describes the fundamental properties of the relational database model and the way it works on the ST. When I began writing Regent Base more than a year ago, I was confronted with a challenge. Regent Software's management team—myself included—needed a lot of information about the company's productivity, sales figures and general profit and loss. At first, I thought I would write several little programs to individually manipulate and report on the information needed. Then the idea of writing a general, all-purpose program to handle all of Regent's information processing needs rolled in—like a locomotive. The result was Regent Base, a program capable of balancing a checkbook just as quickly as it can print a list of receivables. If you were to browse through the pages of any computer magazine, you'd probably run across a bunch of advertisements for database products calling themselves relational. Most people think that a relational database is any software product that has the capability to compare information stored in two separate files and report on the similarities and differences. This is true, but certainly not a good description of the real meaning behind the relational database standard. The word database means an information storage and retrieval system. A database is software for organizing the computer equivalent of 3×5 cards on a disk, where each card has several pieces of information—such as numbers, sentences, times or dates—stored on it. The word relational means, in part, that a database can do more than simply store and retrieve information. The information stored in one relational database can be logically linked to information in another. For example, let's say you keep a list of people who owe you money in one database. In another, you keep a list of people who work with you. With a relational database, you could logically pair the two databases together, creating a list of people with whom you work who owe you money. The important word in the last example is logical. Database systems that are not relational link information held in databases with physical pointers, to keep the computer informed as to the whereabouts of each piece of information (see Figure 1). Nonrelational databases are called "hierarchical databases," because of the physical link needed to store information in a database. Because the structure is so rigid, a lot of design and thought must go into a hierarchical database before the actual database is built. Relational databases don't have this limitation. The origins of a relational database. The term relational database was originally coined by a man named Dr. E.F. Codd about fifteen years ago. Dr. Codd wrote a standard for a theoretical system called a relational database. At the time, the new standard was developed for large-scale mainframe computers. Mainframe computers are great for handling large information processing needs; they normally have huge amounts of memory and disk space. Mainframes are still prevalent in large business and industry, but, with the advent of microcomputers, like the Atari ST, small business and even home users can have the utility and power of a mainframe at a reasonable price. When Dr. Codd wrote the definition of the relational database, twelve rules were defined as a standard to determine if a program was truly relational. Dr. Codd was not a programmer, so when he wrote the definition it was referred to as a model after which programmers should pattern their software. In this article, the term relational model will be used to describe the application of the model. The rules developed by Dr. Codd are very specific in determining ease of use and flexibility of a database program. The underlying message of the twelve rules is that a database should be able to separate the end user from the actual techniques of handling the contents of the database. When information is stored in a relational database, it's available by means of a common language. The end user enters requests in this common language, and the relational database internally figures out the best possible way of carrying out the user's command. The first rule of a relational database determines how information is logically stored in a table. A table is made up of records. Records, in turn, are made up of a group of fields. This ordering of priorities makes a table look much like a spreadsheet, with fields running left to right as columns, and records running up and down as rows (Figure 2). The guaranteed access rule states that all information inserted into any table may be retrieved, manipulated or deleted without restrictions. So, if you create a table and store information in it, any information stored may later be accessed, modified or deleted under all circumstances. The hierarchical database links its information with physical pointers, while the guaranteed access rule makes it possible to link information in a logical manner. More on this later. The comprehensive data language rule describes the use of a set of common commands that are necessary to manipulate information and control the database. The data language rule shows that the language has to follow some sort of consistent behavior. IBM was one of the first companies to develop a working relational database product. IBM developed the SQL, or Sequel, language. Later, the SQL language was adopted as the industry standard relational database language by the American National Standards Institution (ANSI). There are two main divisions of the SQL language: query commands and procedural commands. Query commands are those that cause manipulation of the structure of a table or the data stored in a table. Procedural commands control a database program and usually resemble the control commands of BASIC, Pascal or some other high-level language. Query commands allow you to do two different things. First, you can create, modify or drop a table, thus allowing you to establish the structure of a table or change the structure of an existing table. Second, you can manipulate the information stored in an existing table. —Retrieve information already stored in a table. —Insert new information into a table. —Update or modify information already stored in a table. —Delete information stored in a table. These are the four basic instructions that give you full control over all the information stored in a relational database. The procedural commands affect the program flow and control of the system. Most of the procedural commands can be found in other high-level languages (such as IF. . .THEN, GOTO and LET. Character strings "A person's name"
The other relational data type is the logical data structure. The logical field contains one of three values: true, false or null. Null indicates that the field doesn't contain a value. When a table is created, the fields that will comprise every record within the new table are defined. When a field is defined, three facts are stated about the new field: the field's name; the type of field; and how big the field is going to be. What is the field's name? Each line of this address would be entered into a different field. So, the first line is the name field, next would be the address field, and so on. . . The column to the left contains the field names, while the right column contains the field's contents. If you were to retrieve the zipcode field, it would show 31733. What is the type of the field? The relational model can handle many types of fields, like numbers, characters, dates, etc. When new information is put into a table, the field type becomes quite important. There's a big difference between how a date is stored and how a number is stored. In the example above, two field types were used to store the customer address. How big is the field going to be? Only the first eight characters of the field will be stored. You must define fields that are large enough to handle the data to be stored in them. Of the seven types of fields, only three must have defined sizes: character, integer and decimal. Character fields can be from 1 to 32,000 characters wide and integer fields can be defined up to 10 digits wide. Decimal fields may also be defined up to 10 digits wide, with up to 10 digits to the right of the decimal point. Date fields are of a predetermined size. Here's a typical example of the field definitions for a table. This table will hold several people's names, phone numbers and ages. The first is the name field and is a character field, twenty characters wide. Next is the phone field, which is also a character type, twenty characters wide. The age field is an integer field that's two digits wide. If another person's information is to be added, the new record will be placed at the end of the table. This command will create a new table, Phonelist. In it are three fields for every record: name field (up to twenty characters); phone field (also up to twenty characters); and age field (any number, -99 to 99). Now that a table has been defined, let's see how the SQL query commands work. There are four basic query commands which manipulate information within tables: INSERT, SELECT, UPDATE and DELETE. The INSERT command adds a new record into an existing table. When a table is created, it initially contains no records. This command adds records, while the other commands retrieve, modify and delete records. Thus, the Phonelist table will contain two records for use in the next section. Now that we have two records in the Phonelist table, we can retrieve the records using the SELECT command. Each record contains three fields: the name field, phone field and age field. The SELECT command gathers data from certain selected fields in one or more tables. The retrieved information may be displayed on the screen, printed, sent to an output port (i.e., RS232), or used in another SQL command. So far, the SELECT command examples have retrieved all of the records in the table. If we want to be more specific about which records to select, we can add a WHERE clause to a SELECT command. When processed, the following SELECT command first checks to see if each record meets the WHERE criteria; if a record tests true, it's displayed; if not, it's ignored. When you process this SQL command, only the John Rayston record will appear. ^ Like checks a field using wildcard characters: * ? These expressions can also be used in the other SQL data commands. SQL also supports math functions when processing information. Suppose we wish to how old John Rayston will be in 10 years. SQL can also retrieve the youngest person in the table by using the MINIMUM function. This function finds the smallest value for a numeric field. Once a record has been inserted into a table, it can be modified using the UPDATE command. This command allows you to specify the fields and records to modify. When you process this SQL command, the contents of the phone field in all records of the Phonelist table will be changed to the new phone number in the UPDATE command. This will retrieve the two records in the Phonelist table as shown below. Notice that both phone fields are now equal to 555-2244. When we processed the last UPDATE, every record in the Phonelist table was modified. Like the SELECT command, UPDATE may also use the WHERE clause. When this is processed, the contents of the phone field in the Martha Windum record will be changed to the new phone number. Now that we know how to INSERT, SELECT and UPDATE, the last function to accommodate the guaranteed access rule is the DELETE command, to remove a record from a table. There are two forms of the DELETE command: DELETE and DELETE WHERE. The former allows us to delete everything from a specified table, and the latter allows us to delete specific records from a specified table. So far, we've described the most primitive functions of a relational database using the SQL language. The real power of a relational database is in its flexibility. The SELECT command allows us to treat the information stored in a table as individual objects. The logical pairing of these objects of information is where the relational database shows its greatest power. For example, let's say we have two tables which contain information about certain customers of a company. The first table, Custinfo, has two fields: Customer, which holds the customer number; and Name, which holds the customer's name. The second table, Accounts, has two fields: Customer, which holds the customer number; and Amount, which holds the amount owed to the company. This form of SELECT performs an algebraic function called "intersection." The intersection of the two tables is the common Customer field. The relational database logically produces the intersection of the two tables, based on the conditions of the WHERE clause. This article is by no means a complete description of all the power and functionality built into the relational database model; but it's a good jumping-off point. The relational database model was previously restricted to large-scale mainframe computer systems. The relational approach to databases, though, is gathering momentum in the microcomputer world. Companies such as Ashton Tate, which produces dBase II and dBase III Plus, have announced relational products. Other companies already have a relational database on the IBM PC, like Microrim's RBASE System V.